My family are kind of shrimp addicts. My mom and brother could probably polish off the entire species if they didn’t need to come up for air. As far back as I can remember, they would always order it at restaurants and binge on endless shrimp cocktails while we were on vacation. After they’d polish off all the shrimp on their plate, they’d count the tales and be shocked at how many they actually ate. It was ALWAYS more than they thought. Like I said – addicted. 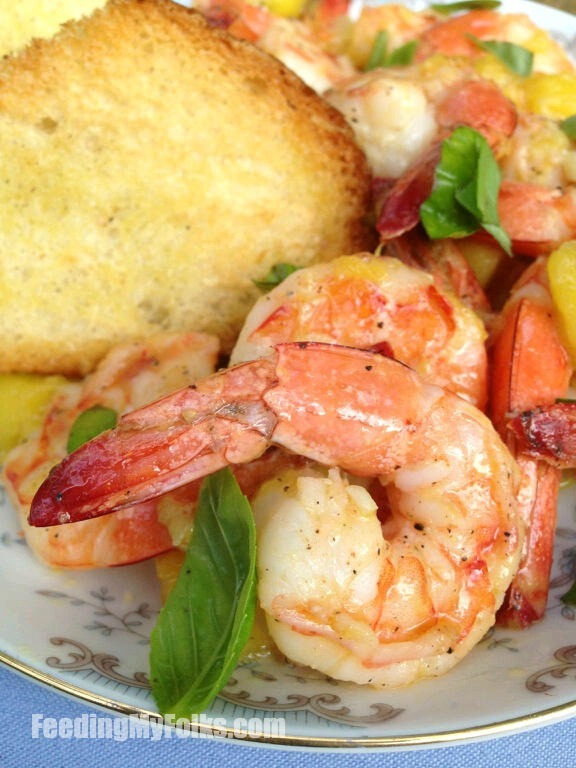 The best part about this particular recipe is the garlicky butter/oil that coats each shrimp and gives the dish a decadent richness. Chopped mango give it a tropical feel, while the lime and hot sauce brighten the flavors. And since I love topping a recipe with fresh herbs, I loosely tear some basil over each plate. It’s an amazing marriage of flavors. Oh, and it’s great for a last minute meal. It should take no more than 10 minutes to make. 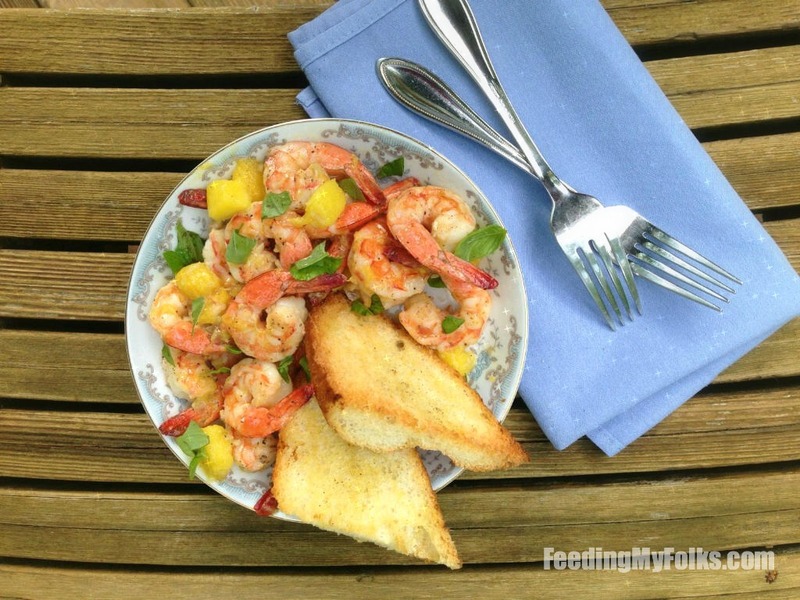 This garlic mango basil shrimp recipe is sweet, tangy, fresh, and summery. Toss it with pasta, over rice, wrapped in warm tortillas, or with bread. Make it! In a large skillet over medium heat, add the oil, butter, garlic, and red onion. Cook for 2 minutes. Sprinkle the shrimp with salt/pepper. Add to the skillet. After 90 seconds the shrimp should start to become pink. Add the mango and stir. Add a pinch of salt/pepper. Drizzle in lime juice and hot sauce (if using). Cook for 2-3 minutes, stirring occasionally, until shrimp is fully cooked. Tear basil over the shrimp. Serve with bread or over pasta. So delicious!! 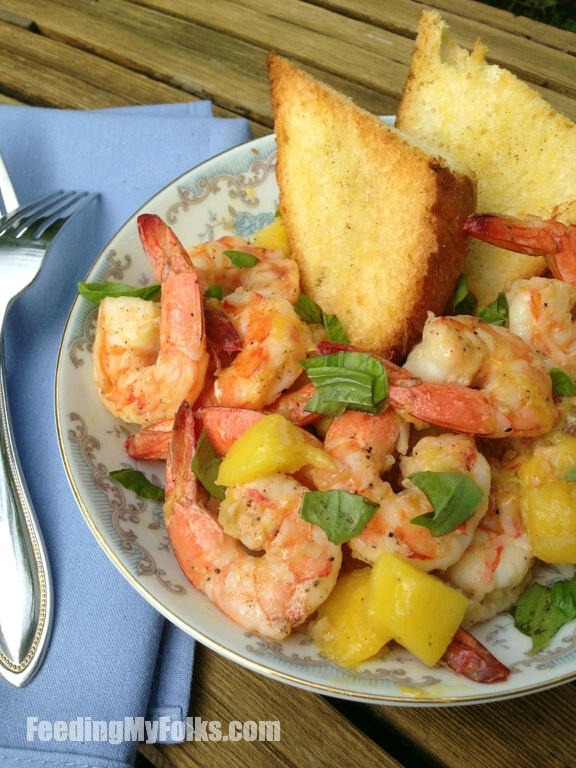 All shrimp lovers should try this dish!! You always post the most delicious dishes during lunch time while I’m at work. What a cruel, cruel thing to do. There’s no such thing as too much garlic!